Hannah Tobin leads a pack of runners. The freshman finished seventh among Wildcats at NCAA Regionals. 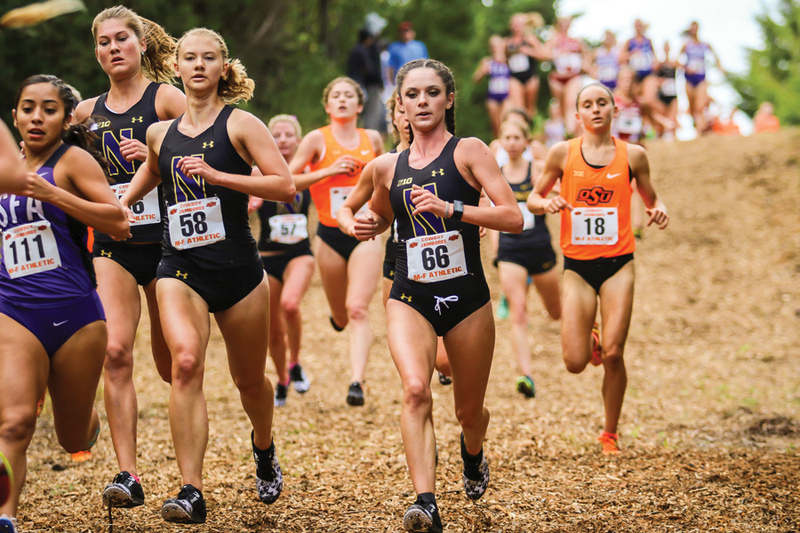 Aubrey Roberts was the silver lining in Northwestern’s disappointing season finish at the NCAA Midwest Regionals in Ames, Iowa, this weekend. At the race, hosted by Iowa State, the sophomore extended her impressive second season for the Wildcats and clinched a bid to the NCAA Championships on Nov. 18. NU went into Friday hoping to secure a team bid to NCAAs but fell short, making the six-kilometer race its last event of the year. The Cats were led by Roberts, who finished fourth for the second straight season, this year with a time of 20:16.7. As one of the top four runners from a team outside the top two qualifying teams, Roberts locked down a trip to Louisville, Kentucky, for the championships. Roberts said she was pleased to qualify for NCAAs, where she placed 50th last year out of 253 runners. Coach ‘A Havahla Haynes said Roberts has run more conservatively in previous races to serve the team as a whole. She said Roberts will race this weekend with a different, more individualized mindset. NU came into the weekend’s meet ranked fifth in the region, their highest regional ranking in four years. The Cats finished ninth out of 33 teams with 301 points, compared to eighth last season. The team would have needed to be in the top two to qualify for NCAAs. Senior Isabel Seidel — who finished second on the team and came in 29th overall with a time of 20:56.0 — said she was pleased with her individual race but disappointed that NU failed to qualify. Following Seidel was sophomore Sarah Nicholson with a 35th-place finish in 21:04.1. Nicholson had finished second among her teammates in all other races this year. The next finishers for the Cats were seniors Sara Coffey, Andrea Ostenso and Haley Albers. Freshman Hannah Tobin rounded out the top seven Cats runners. “We will be back next year,” Seidel said.